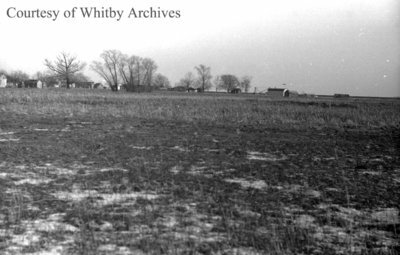 A black and white negative of Lynde Shores Conservation Area/Cranberry Marsh in January of 1938. View is of the Marsh looking towards Port Whitby, Ontario. Cranberry Marsh, January 1938, Marjorie Ruddy. Whitby Archives A2013_040_726A.